I don’t know what possessed me to borrow this book from the library! If I wanted to read about natural disasters all I had to do was read the news: this is a week when Super Typhoon Hagupit displaced thousands of people in a mass evacuation and Brisbane is cleaning up after a super cell storm caused a damage bill of over $800 million, reviving memories of the 2011 floods when the Brisbane River burst its banks. Given that there are dozens of major cities around the world that are built on rivers, there have been countless major flood events for one reason or another, and historians could no doubt flood the market with stories about them all. But tourists love Paris, and so a book about their flood in 1910 was bound to be of interest. 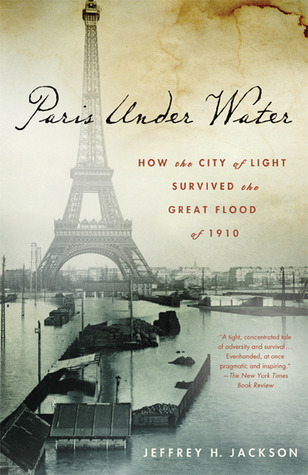 And so Paris Under Water appears to be, if you check the uncritical GoodReads ratings. But truth be told this is a rather dull book. It’s well-researched (lots of footnotes &c) but badly written, with repetitive assertions and inadequate analysis. Once the initial fascination with the idea of Paris under water lapses, the book becomes a bit of a slog. In late January 1910, following months of high rainfall, the Seine River flooded Paris when water pushed upwards from overflowing sewers and subway tunnels, and seeped into basements through fully saturated soil. The waters did not overflow the river’s banks within the city, but flooded Paris through tunnels, sewers, and drains. In neighbouring towns both east and west of the capital, the river rose above its banks and flooded the surrounding terrain directly. Jackson’s book makes 288 pages of this, expanding to explore the social, cultural and political history of the City of Light. It places the flood in the context of a city proud of its technological developments that was brought to a standstill by filthy water spreading upwards from its smart new Metro tunnels and its spectacularly inadequate drainage system. It has a hero, an indefatigable prefect of police called Lépine, whose fierce determination to his duty is likened to Victor Hugo’s Inspector Javert. It has stories of Parisians helping each other, and hard-luck stories for added sentiment. But in tracing the rise of the river, Jackson makes clichés of his own phrases, inundating the reader with numerous references to the Zouave statue on the Pont de l’Alma. Used popularly as a measure of the river height, this statue is mentioned on twelve separate pages. More importantly, Jackson seems unable to decide on his own stance about the matters which are at issue. It’s common enough to see cities rise to the occasion when disaster strikes. From the stoicism of Londoners under the Blitz to the way people in Brisbane rallied to help with the clean-up in 2011, it seems that people become their best selves in mass disasters. This can be inspirational but it’s also fertile ground for myth-making. For there are usually looters too, and selectiveness in the aid that’s provided, and there is anecdotal evidence that there are people who cope less well psychologically than others. Again and again Jackson writes about the spirit of Parisians as they doggedly navigated the waters, moved to higher ground, organised flood relief and eventually managed the clean up. But in a country that prides itself on liberty, equality and fraternity, there were inequities, and even a popular history should have made a more coherent effort to analyse the situation rather than muddying it with numerous examples of claim and counter-claim. In the wake of events like Hurricane Katrina where there were accusations that discrimination affected the management of disaster relief, the Paris Flood offers an opportunity for critical analysis of this issue. At the conclusion of this book I still did not know whether or not the historian thought the disaster relief was fair or well-coordinated overall. Some loose ends are annoying. In the chapter called ‘After the Flood’ we learn that suburban towns with fewer resources took longer to manage the clean up, and that a school in Villeneuve re-opened in an incredible state of filth and disarray. Flood relief money went to families, not to public buildings, and there was no money to buy cleaning materials and little infrastructure to deal with waste removal and repair. But presumably the school was cleaned up and I would have liked to know by whom. Did the authorities let little kids splash around inside a filthy school? Did the parents organise a working bee? If the sources are silent, the book should say so. Did you spot the puns in my review? I couldn’t resist it…. Erik Johnson also reviewed it for the NY Journal of Books. I was very excited to see you reviewing a Paris book Lisa (one which I hadn’t heard of either)- then I read your review. I suspect I won’t search it out- my library doesn’t have it- and I have many, many Paris books already waiting to be read. Still I enjoyed reading your thoughts, and I like the cover. It makes me feel cold just to look at them!